Our politics are like a major storm watch. Most of us think we are not in the flood zone, that others bear the risk. But our civic foundations are eroding, and much of what our forebears won for us could be swept away. Yet hopes are rising as the Trumpist storm feeds on itself. Paul Manafort has flipped. Special Counsel Robert Mueller is tightening the noose. As Hurricane Florence bore down on the Carolinas, Donald Trump disputed the official death toll from last year’s Hurricane Maria in Puerto Rico, a debacle for which (as always) he gave himself an A+. Meanwhile, the purported Deep State turned out to be led by the president’s own staff. Trump’s shrillness increases against his predecessor, his defeated rival, his critics, reporters, and athletes. As he unravels, he resembles Captain Queeg in The Caine Mutiny. He is both dangerous and ridiculous. He is an improbable leader, which is why few took his candidacy seriously. Smartphone warriors on platforms like Reddit love wielding over-the-top verbal missiles like “Ben Shapiro ABSOLUTELY DEMOLISHES Libtard Feminazi Charlie Kirk.” This recalls the plague victim in Monty Python’s “Bring out your dead” scene who cries, “I’m not dead!” Trump’s true believers hurl schoolyard taunts at Bob Woodward’s detailed reportage, yet it remains very much alive. Appealing to reason instead of passion is harder, but success in that effort is more enduring. In sorting out candidates, we do well to consider what people’s best roles are. Everyone who excels at what they do doesn’t merit a promotion. Here are two examples: Sen. Elizabeth Warren is sharp-witted and effective at grilling witnesses. Stormy Daniels’s attorney Michael Avenatti is bold, scrappy, and well suited to taking on Trump’s nihilist right. Neither should be president. The Democratic standard bearer needs to connect with independents as well as party stalwarts. Avenatti, age 47, at least passes the entry-level test of whether presidential candidates are closer to 48 than 78. Most Democratic presidential aspirants meet basic criteria of smartness, diligence, sanity, and non-treasonousness. Several, however, are over 70. It is time for the Democratic team to freshen its bench. It bodes well for 2020 that the midterms have brought so many new faces, including a record number of women. There are signs of a turning tide. Ohio billionaire and Republican donor Les Wexner has renounced the party and praised President Obama. Boston billionaire Seth Klarman, previously New England’s biggest Republican donor, is giving millions this year to Democrats. The Pew Research Center reports a surge in turnout for this year’s U.S. House primaries, especially among Democrats. Many Centrist Democrats have adopted popular progressive policies. Our besieged constitutional system shows resilience. News broke on September 16 that Christine Blasey Ford has come forward with her allegation that Supreme Court nominee Brett Kavanaugh sexually assaulted her more than thirty years ago in high school. 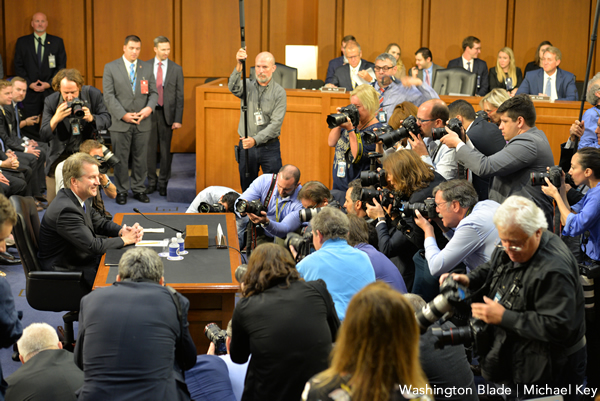 She told The Washington Post about it before Kavanaugh’s nomination, and passed a polygraph test administered by a former FBI agent. Stephanie Mencimer notes in Mother Jones that the alleged witness in the case, Mark Judge, who attended Georgetown Prep with Kavanaugh, has written about rampant drunken partying there. That might explain his inability to remember the incident. Senate Republicans have used a process complaint about the lateness of the charge to distract from its credible substance, inadvertently demonstrating why victims of such assaults hesitate to speak up. Power trumps all for the Republicans, who are in a hurry to install a wildly unrepresentative right wing majority on the court while they can. The battle over what kind of country we will be goes on.